We are a recording studio, &, an Independent online publishing record label (Stillbliss Records), based thirty minutes by bus, from Hashimoto station, in Kanagawa Ken. The studios are located near the Tanzawa mountain range & Sagami river. This is a great place to relax and recharge, all in the space of recording your album! Our gear list: Some brands & gear that we use here at the studio-The Black lion audio– boutique single channel preamp-BLA 173, Fender USA- 1987 Standard Strat, RME- Multiface AD/DA converters, Event- ASP6 Studio monitors, Cakewalk- Sonar Producer edition DAW, Damage Control- Womanizer boutique distortion pedal, Hiroshi Tamura,-Vintage Classical guitar, Yamaha RBX bass guitar, FMR audio- PBC6a aka: Professional balanced compressor, Catalin bread– Dirty little secret distortion pedal, Shure- KSM 32 SL Professional studio capacitor microphone, Waves- power pack plugins & many more, Mackie-onyx 1620 Boutique analogue mixer, Antares,- Autotune tuning software, Sony- Soundforge editing software, Soundtoys,- microshift etc…! 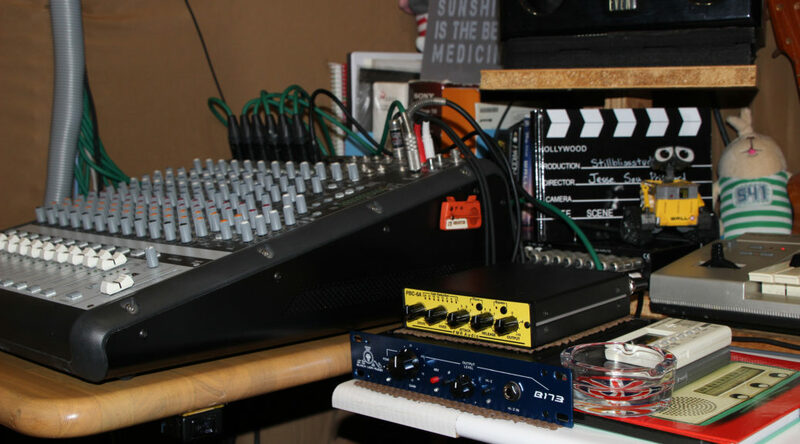 Is to cater to your special musical needs, whether it be recording vocals, online radio shows, recording guitar, or drums, or your band, as well as showcasing your work on our site, and helping you get your tunes onto most online retailers, ie, Itunes, Amazon, Spotify, Google play, etc. We also offer the service of online digital phat mastering! For only, 20$ per track! (We listen to your trax through 1K$ monitors,) Which is one of our hot $ervice$. We use IK multimedia`s T-Racks standard edition for all mastering, as well as the Waves L2. We can get your tracks or whole album, real hot. And ready for digital distribution. We also offer the service of mixing through our boutique analog gear. We receive payment through paypal, postal, or cash on hand. you must have some relation to our studio, whether through recording, or our mixing & mastering services. We also connect to our artists through the net, by sending STEMS back and forth for mixing or session work. We have worked with artists from the likes of New Zealand, UK, USA, Africa & more. We can speak English and Japanese. We’ve had two of our clientele tunes get onto Japanese Karaoke. Also another artist that recorded here had his tune used on a Toronto Independent movie. Also on another note- One of our first clients who came over six years ago, has over 17,700 listens on one of his Soundcloud ulpoads. Since then, we have dramatically improved our recording chain. Also indie rock band Slingshotmillion has had a track of theirs, (Completely done here) on High Beam Record`s 2018/11/28 release. Also one of their trax, that were engineered here, other than mastering has over 17,000 views on YouTube. Also one of our clients who`ve used our mastering &- adding elements to a mix services, for a Japanese cultural festival tune: won first prize for best performance. Come try us, and our services out! We are always looking forward to hearing & working with you! Lagoli and Yui! YouTube Radio recording session. Pt. 11 Of radio talk show with Lagoli. Pt. 10 of lagoli. Talk show. Slingshotmillion uploads a new radio talk show again.